Neither Christopher Columbus nor his contemporaries thought the earth was flat. Yet this curious illusion persists today, firmly established with the help of the media, textbooks, teachers-even noted historians. Inventing the Flat Earth is Russell's attempt to set the record straight. He begins with a discussion of geographical knowledge in the Middle Ages, examining what Columbus and his contemporaries actually did believe, and then moves to a look at how the error was first propagated in the 1820s and 1830s and then snowballed to outrageous proportions by the late 19th century. But perhaps the most intriguing focus of the book is the reason why we allow this error to persist. Do we prefer to languish in a comfortable and familiar error rather than exert the effort necessary to discover the truth? This uncomfortable question is engagingly answered. 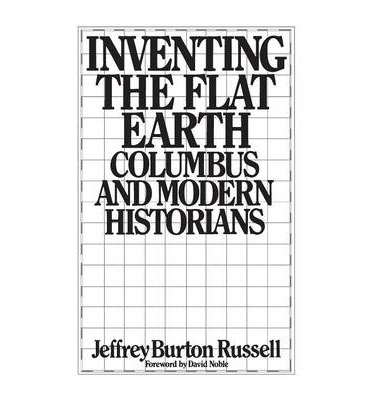 Inventing the Flat Earth is Jeffrey Burton Russell's attempt to set the record straight. He begins with a discussion of geographical knowledge in the Middle Ages, examining what Columbus and his contemporaries actually did believe, and then moves to a look at how the error was first propagated in the 1820s and 1830s-including how noted writers Washington Irving and Antoinne-Jean Letronne were among those responsible. He shows how later day historians followed these original mistakes, and how this snowball effect grew to outrageous proportions in the late nineteenth century, when Christians opposed to Darwinism were labelled as similar to Medieval Christians who (allegedly) thought the earth was flat. But perhaps the most intriguing focus of the book is the reason why we allow this error to persist. Do we prefer to languish in a comfortable and familiar error rather than exert the effort necessary to discover the truth? This uncomfortable question is engagingly answered, and includes a discussion about the implications of this for historical knowledge and scholarly honesty.